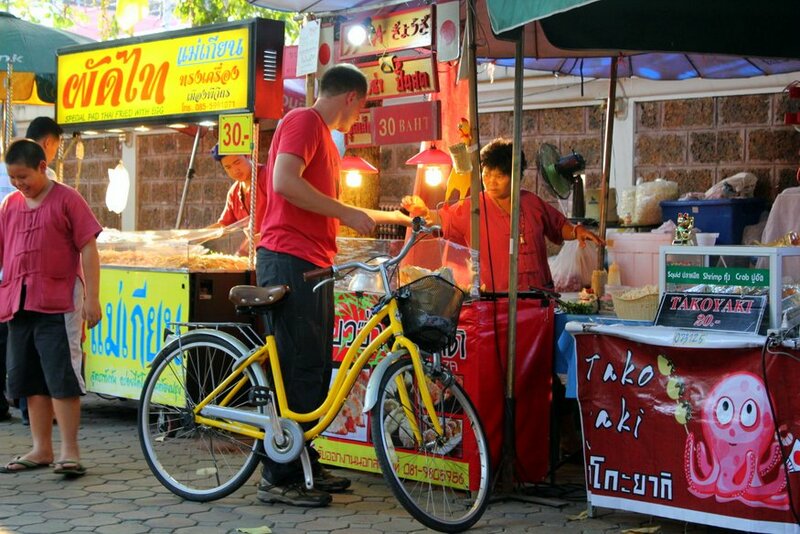 Every Sunday from 4pm – midnight, Rachadamnoen Road, also known as Chiang Mai’s “walking street” closes down to traffic and fills with roadside vendors selling handicrafts, exotic foods, fresh fruit smoothies, warm waffles (my personal favorite! ), and so much more! 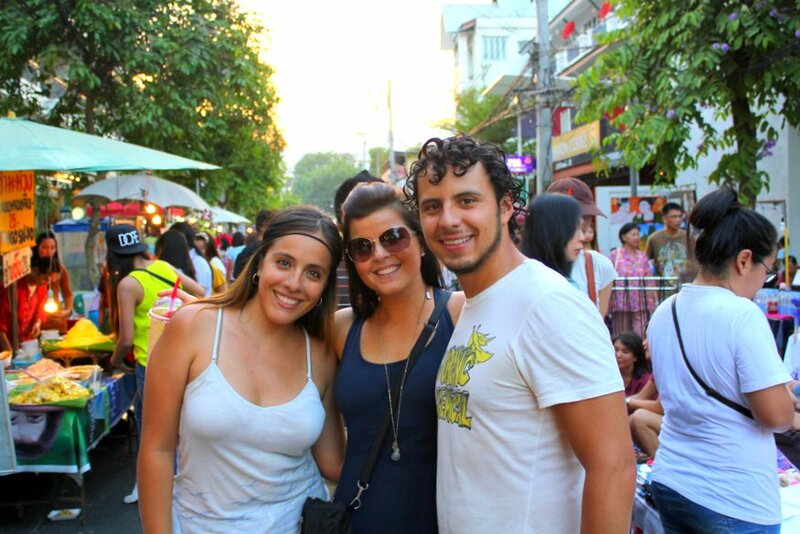 Last week we met up at the Sunday Night Market with Arturo and Fernanda, followers of Pause The Moment who happened to be in Chiang Mai for the week. How fun! Arturo & Fernanda from Xalapa, Mexico! The Sunday Night Market tends to get very busy once the sun goes down, so we hit the walking street early in search of cheap food and light foot traffic. Lots of fresh smoothies ready to be made! 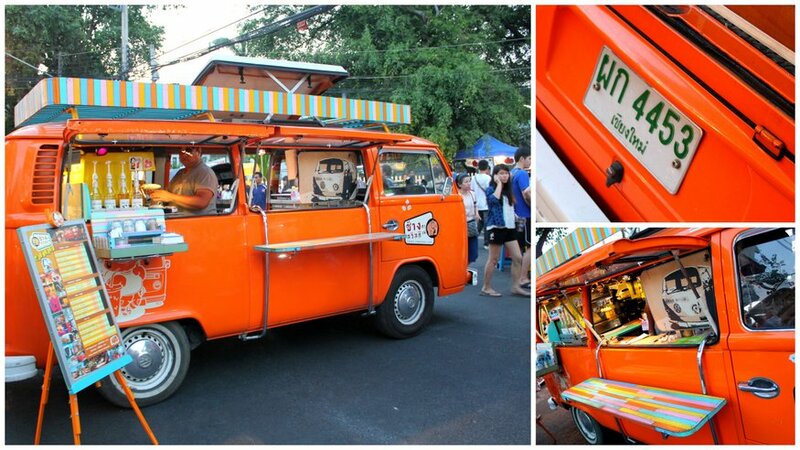 Vintage van turned mobile coffee shop! 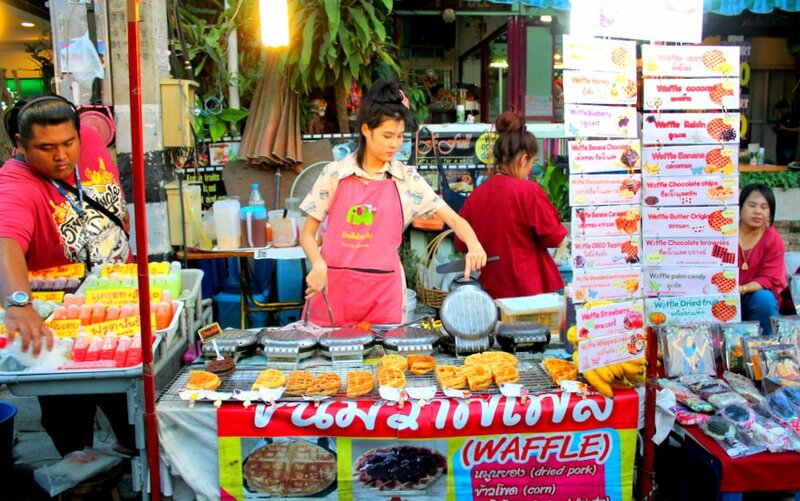 If you ever make it to the Sunday Night Market, be sure to grab yourself one of these delicious freshly baked waffles shown below. Freshly baked street waffles, anyone? 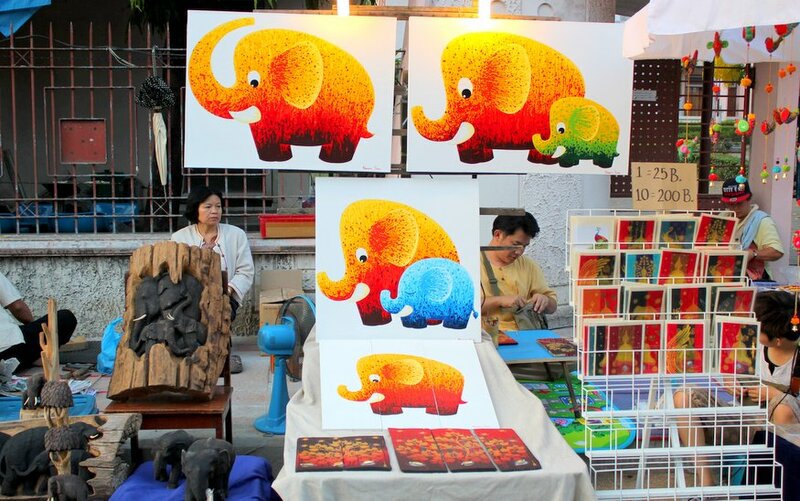 The Sunday Night Market is filled with beautiful artwork. I thought these paintings were really cute. Can you spot the Dunkin Donuts cup? You New Englander’s will know what I’m talking about. Fernanda was in search of a new shirt but couldn’t seem to find anything that she loved. 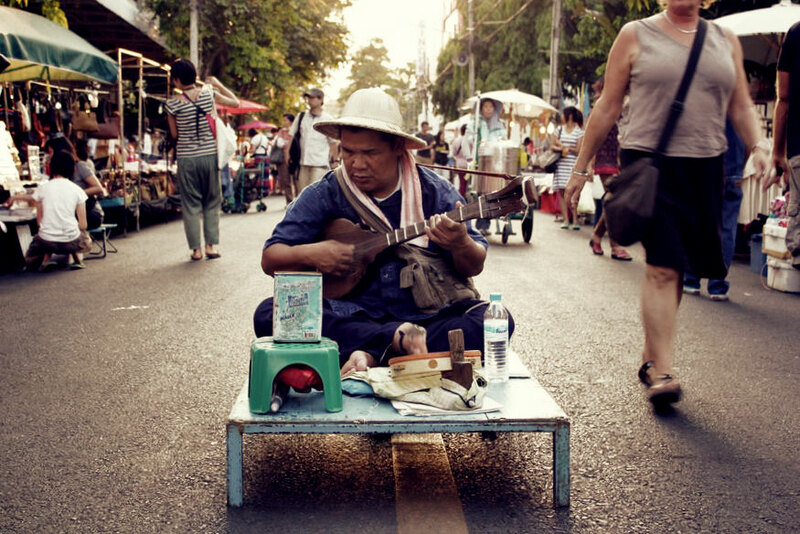 Tourists and visitors will enjoy the variety of street performers, Thai dancers, and musicians. 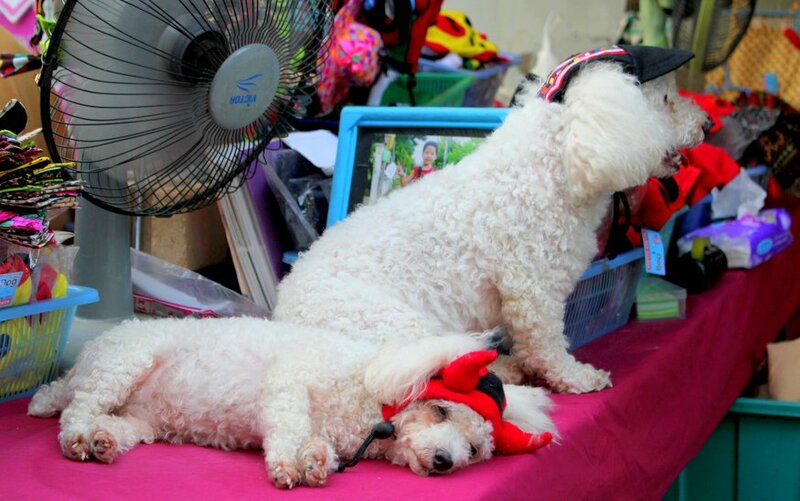 You might even see a few wacky looking dogs along the way. 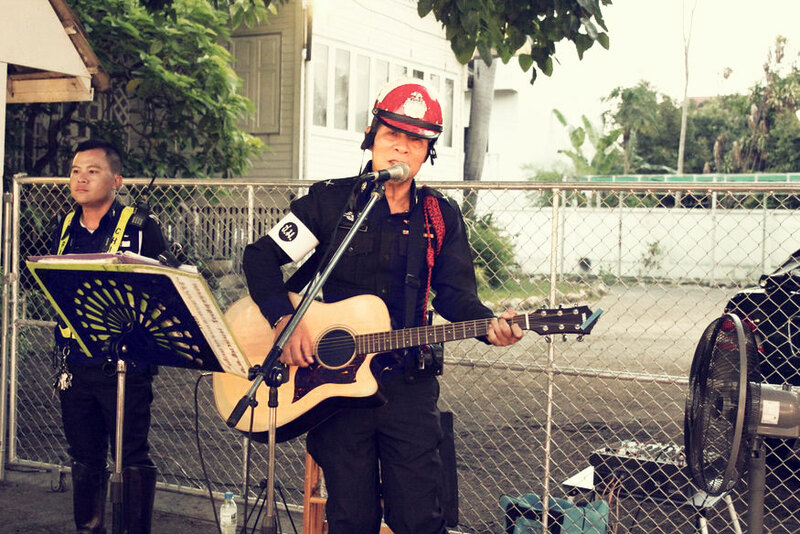 One of the more interesting performances was the one put on by this Thai cop in full uniform. The police tend to be grossly underpaid here and I’m guessing that’s why this man is out here working a second job. How do I even being to explain this next photo? 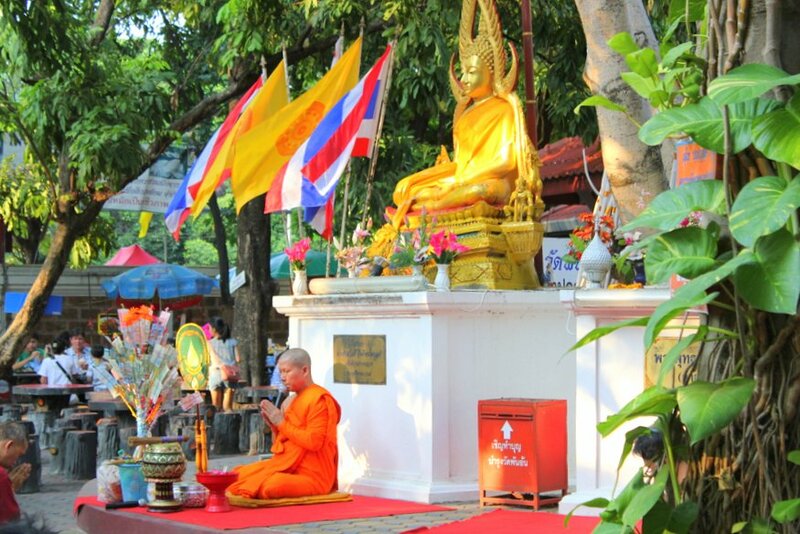 The temples along the road open their grounds up to a variety of vendors, transforming them into small food courts. Aw, look who it is! 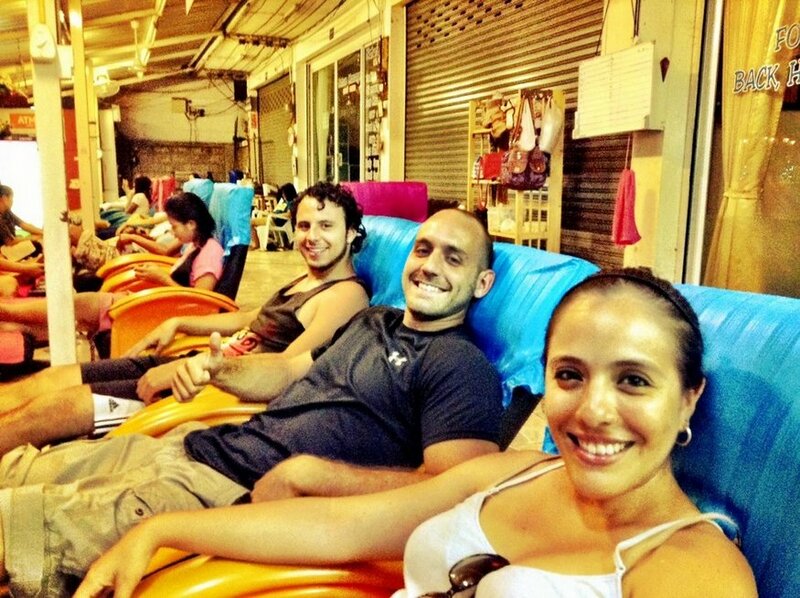 TIP: After walking through the markets for a few hours, we recommend you head over to Loi Kroh to the road side massage parlor located across from the Raming Lodge Hotel where you can get yourself a 30 minute leg and foot massage for just $2 USD! 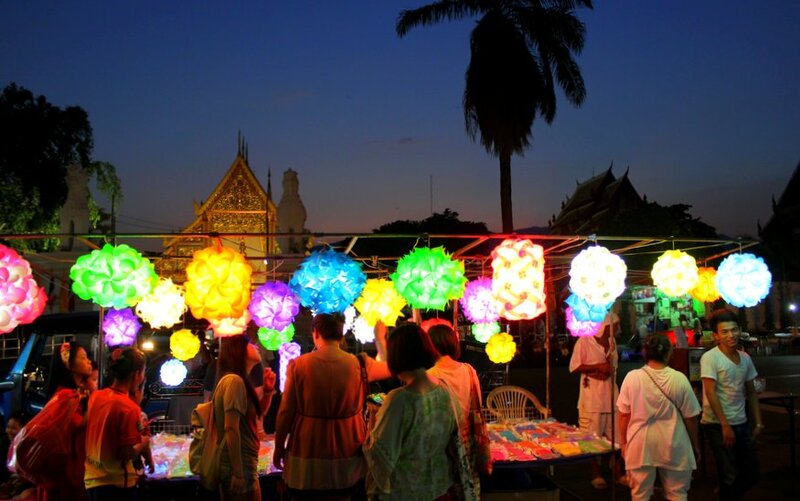 Have you been to the Sunday Night Market in Chiang Mai? If so, we would love to hear from you in a comment below! 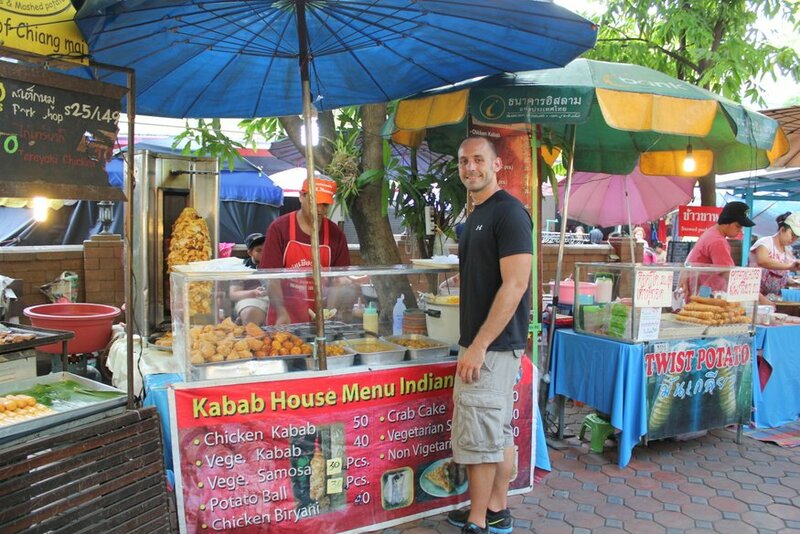 I was at this market in January and my fav food there was the green mango salad made fresh for every order. My friends had never tried it before and it became their new addiction too. Also, a great gift to buy there for about $3 is the beautiful silk pillow covers. 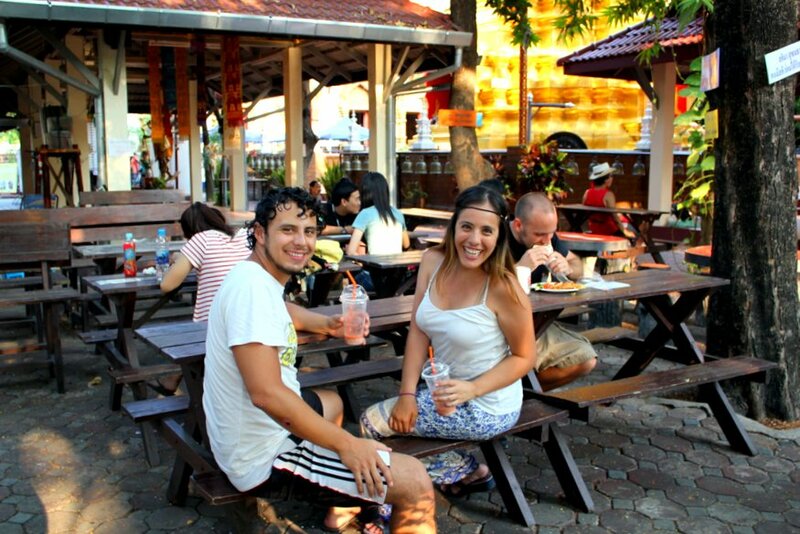 We travelled Thailand, Cambodia and Singapore for 7 weeks and this was our favorite market :-) Chiang Mai and Elephant Nature park were my favorite part of the trip. Highly recommend both. Thanks for the tips Kim! The mango and papaya salads are also some of our favorites and there’s no question that ENP is a must do while in Chiang Mai! What beautiful, bright colors in your photos. It makes the market look so alive, invigorating and inviting. I’ve never been to this market, but I hope to go there some day. Especially to try all of that yummy looking food you posted. 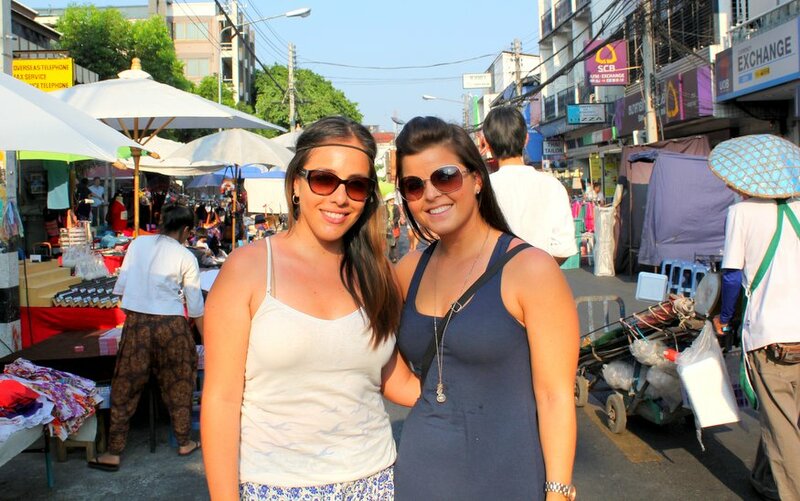 We loved this market. Our favourite memory was a family buying a variety of fried insects, cockroaches, grasshoppers etc and offering them to us to try. 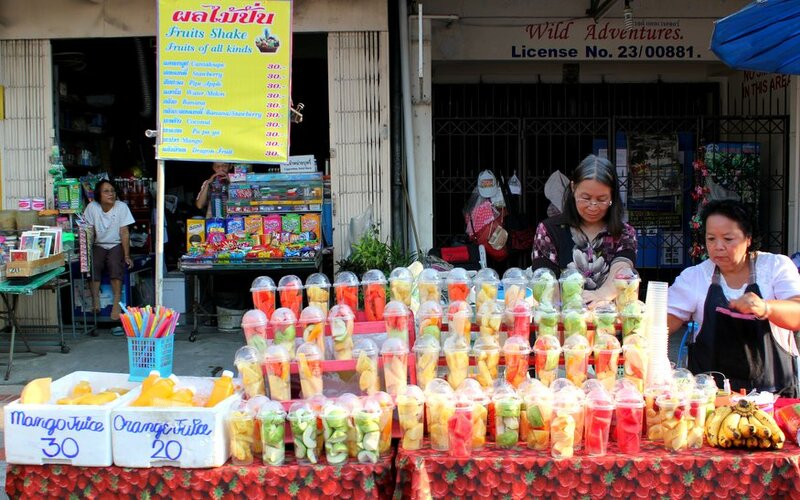 I declined by my husband tried them his only response was ‘crunchy’ wonderful place Chaing Mai. Michele your husband is pretty adventurous! That is one thing both Ryan and I draw the line at! 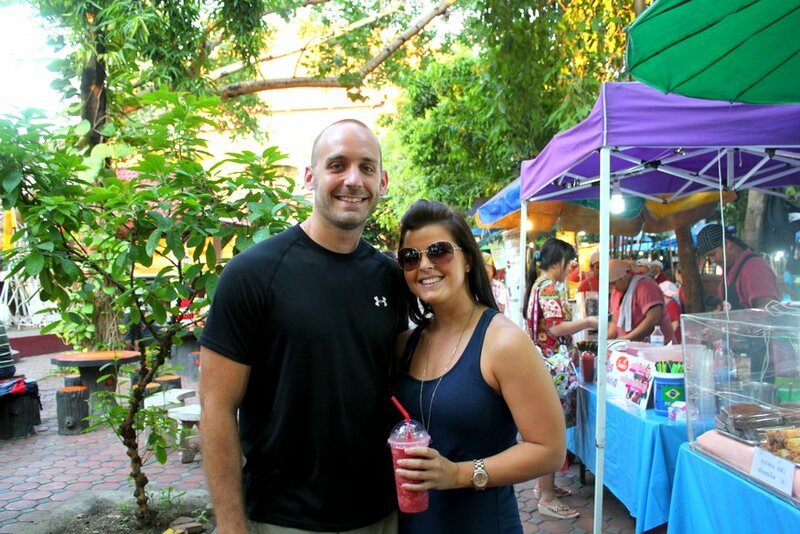 Hi LIz and Ryan, The pics are amazing and Im falling in love with Thailand through you too. I have to visit that country in the near future!!!! Keep the great posts coming!!!! Can you please bring some yummy yummy food back???? Everything looks sooo good!!! 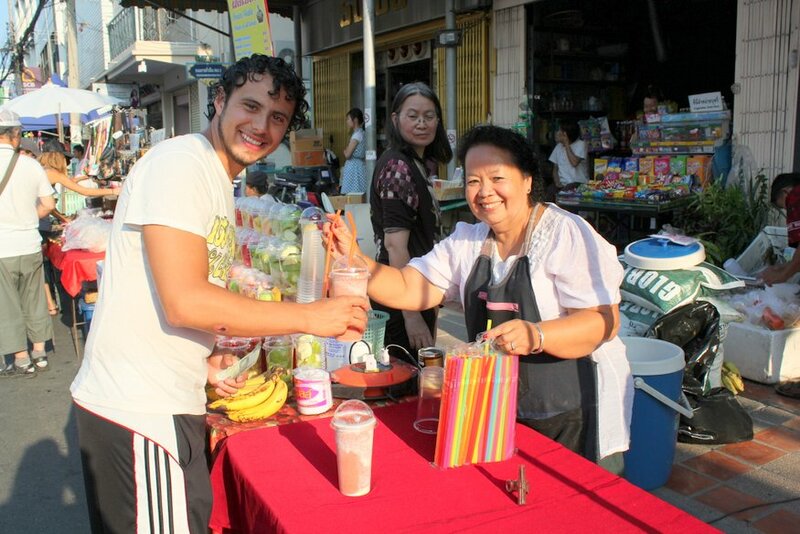 Nice pictures, my wife recognized a few of the vendors & shop owners as she taught massage at Nerve Touch Massage. 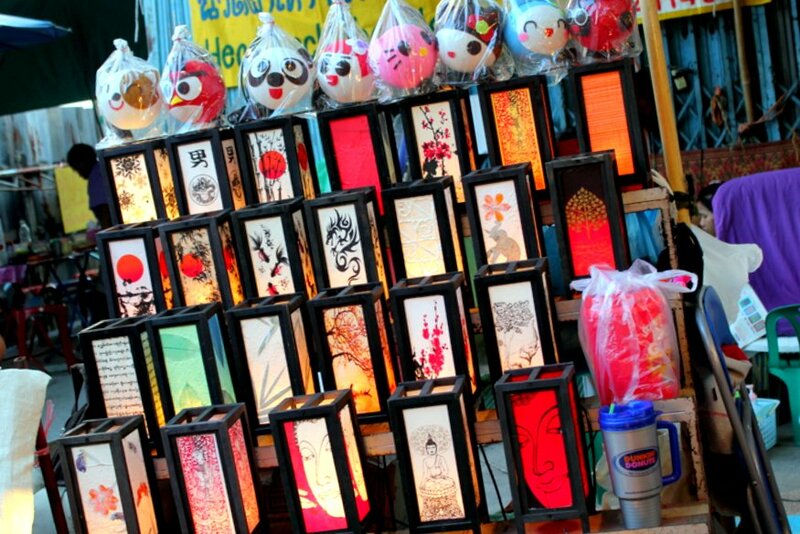 The best night market in South East Asia for me.